This past weekend, Shalane Flanagan went for the American Record at the Berlin Marathon. She needed to run below a 2:19:36 (crazy town). Although she didn’t get it, she did run a 2:21:14, and ran 48 seconds faster than her personal best. 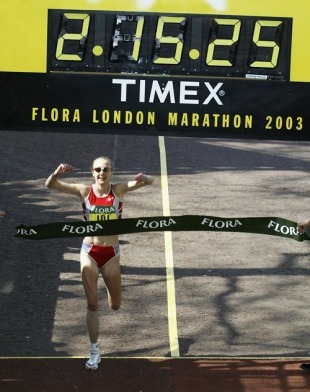 In April, she also ran the Boston Marathon (I was there! ), and led most of the way, running at a blistering pace. She didn’t win, but she ran the fastest time an American woman has run at Boston, and many of the women who ran that race (and who ran Berlin), ran PRs. The winner of the Boston Marathon, Rita Jeptoo, ran a course record that day (by almost two minutes!!). Furthermore, the second and third place females also ran under the course record. So what’s my point? My point is that elite runners are able to break through mental barriers. 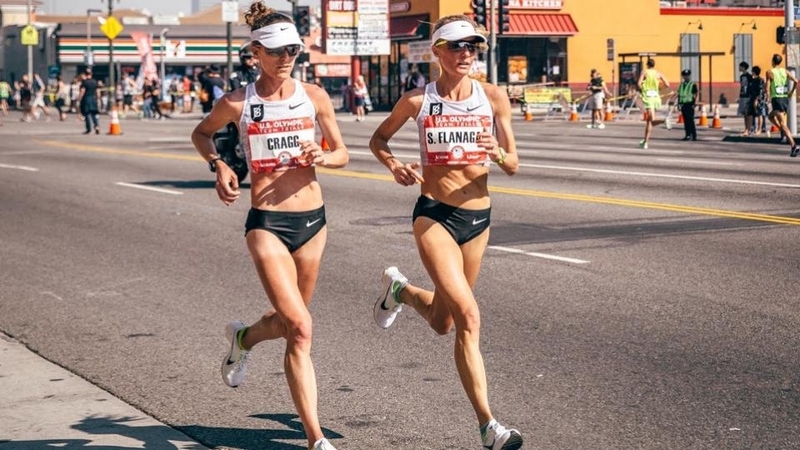 When Shalane set a pace, other women went after it no fear. They knew they were running faster than their personal record pace but went for it anyway. That’s why so many ran below the fastest course time in Boston. They didn’t doubt their abilities. Rita gave me credit again at the awards ceremony that night, and credited me with her record run and she said she actually didn’t want to run that fast early on, and I think she was a bit frustrated. But she told me she couldn’t let me go. If she gave me any room, she may not make it up. It was too much of a gamble, so she just had to stick with the pace. Shalane is known for racing hard and “wanting to hurt” in races. She’s not afraid to go out fast. All of these elites aren’t afraid of going out fast and working for it. I want that kind of grit when it comes to racing, especially in longer distances. PS – She was aiming for 5:19 mile splits when trying to get that American Record. So crazy to me!! I admire that she laid it all on the line and told the media exactly what her goals were. Sometimes I’m afraid to do that for fear of not meeting those goals, or being WAY off. I want to learn how to be mentally strong in races like those elite runners. Running really is a mental sport. Sure, in marathons (and in training) your legs get tired and achy, but sometimes it really is all about your mental fortitude. Can you push through and ignore your body being tired? When you start thinking, “I can’t do this,” can you immediately stop and switch your mentality? In future races I’m going to think back on Shalane’s races and be motivated to push through. A good analogy I read recently was this: Squeeze your fist as hard as you can. Now squeeze harder. You could squeeze harder couldn’t you? Same thing goes for pushing your body. You can probably push harder when you think you can’t. Now I’m really pumped for my next 5K and especially my half marathon in November!! Have you watched any of Shalane’s recent races? She is one of my main running inspirations! What can we learn from Shalane Flanagan's American record attempt? Wow, Boston was just amazing. I was only there for 2 days but my mom and I had so much fun! We left Sunday morning after Easter Mass. We stopped for lunch in Falmouth because we wanted to check out Cape Cod, though we kind of wish we didn’t. It was pretty dead (obviously) and we wished we could have driven to Provincetown but it was just too far. We should have just gone straight to Boston and explored there. Anyway, after we left Falmouth we went to our hotel to take a quick nap. Then went into Boston to check out the finish area and get dinner. It was crazy to be walking down Boylston Street and imagining how things were one year ago. But you could feel the buzz…you could feel that everyone who was there wanted Marathon Monday to come back strong and be truly inspiring. And it was. We woke up at 6 AM Monday to take the T train into Boston. We had no idea what time we should get to the finish area to get a spot, so I just took a guess and said 7:30. We were right! Probably 30-60 minutes after we got there it was packed. I was so mad at myself because I THOUGHT to bring folding outdoor chairs but figured it’d be a pain to lug around. So we ended up buying 2…$25 each…. Anyway, pro-tip if you will ever be at the finish line waiting for a runner, stake out a spot by the Starbucks. They let you use their bathroom! Plus you can go in and get all the coffee you want The line did get pretty long but moved pretty quick. I was really excited to see Shalane Flanagan. Even though she didn’t win like she so badly wanted, everyone was so proud of her. We were all cheering like crazy when we saw the pro women coming in. Shalane got a PR AND fastest course time for an American woman…so she should be pretty proud! And let’s talk about Meb. He’s turning 39, and got a PR…and was the first American to win the Boston Marathon since 1983!! As he came in, the crowds went wild and were chanting USA! USA! My mom and I have met Meb, and he is such a down-to-earth individual. If you listening to his interviews before and after the race, you’ll know what I mean. He did it for Boston. After the pros came in, we stuck around to cheer on everyone else. Boylston Street was so loud! It would get even louder when we saw a runner who was struggling a little or stopped to walk. That’s what gets you through a marathon…and what got my through tough points in NYC. Overall, it was such a beautiful day! The weather was perfect, the streets were packed…everyone was “Boston Strong.” I totally fell in love with Boston. One day, my mom and I will be back…as runners! We were so inspired, we vowed we will try our hardest to qualify (one day). Have you ever ran the Boston Marathon? Or been a spectator? Did you watch the live stream? Any tips for chasing that BQ? Would you rather… run with one of your ancestors or your role models? I think I’d have to say role models…and choose one of my running idols Kara Goucher. I’d love to pick her brain about running, life and more! 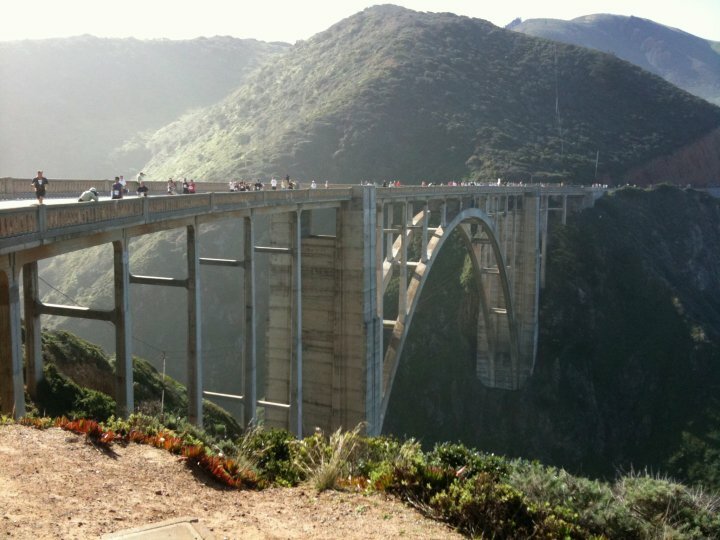 Would you rather… run a race that is a few hours drive but in a beautiful location or in your city with a short drive? Would you rather… take an ice bath for a half hour or foam roll for a half hour? Would you rather… have a black toe nail pulled off or have your entire back chaffed from running and be forced to shower for a hour straight? I actually have two black toenails forming right now and it is so painful, it hurts to even rub against my comforter at night…so I’d have to say I’d rather them get taken off and just get it out of the way. Would you rather… spend an extra $100 a month given to you on running/fitness or save it? I would rather save it. I am paying off my car and would like to save up to buy a house (though not anytime soon), and any little bit helps in terms of saving! Would you rather… be known for running the fastest marathon or running the longest distance at one time? Definitely fastest marathon. 1) I don’t think I could run farther than a marathon and 2) It’d be pretty cool to say you have the fastest time in any distance. Would you rather… have your medal handed to you by Kara Goucher or Shalane Flanagan? Ahhh this is tough! Can I choose both? Can I also have ripped abs and live in a location this scenic?? They are both my running idols…I can’t chose! Would you rather… lick someone else’s armpit after a marathon, or lick their foot after a marathon? I don’t know how Cori thought of this question lol…but I’d have to say armpit. At least it’s only sweat as opposed to dirt and who knows what else on someone’s foot. Here are the questions if you want to do this on your blog! Would you rather… run a race that is a few hour drive but in a beautiful location or in your city with a short drive?